With the conker season approaching, children in Forms I, II and III volunteered to drill and string more than 100 conkers in readiness for the Ashfold Conker Championships. 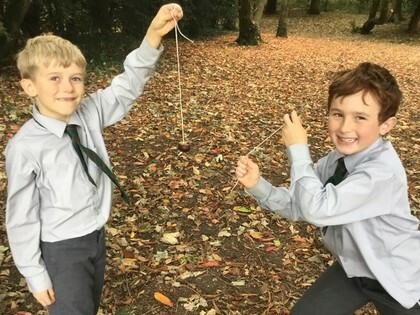 Mrs. Quinton showed everyone how to hold the string and explained the rules - players take turns at whacking their opponent's conker with their own, with the aim of smashing their opponent's one to pieces. The winner is the player whose conker endures longest. Children in the Junior and Senior Departments had a great time battling it out during break times.